Evolutionary processes are also subject to evolutionary pressures. The system functions follow an upward evolution of the evolutionary processes working on them. At first, the transition from phylogenetic adaptation to self-determined adaption of the individual takes place. The characteristic which was first adapted via selection is now adopted as function by the control mechanism. The system is now capable of changing the characteristic as required. Feedback from sensors is necessary. Successful attempts of the search process now ongoing are memory stored and thus turn into the model for an optimization according to the orientation process. This gradual internalization of the entire evolutionary criterion leads to an integration of contexts and coherences into a theory of the system/environment relationships. With conscious initial realization of the adaptive pressure between system and the environment, the flow of information starts to reverse. Function by function, at first on a trial-and error-basis, the system goes into action. Once successful attempts are memory stored again, orientation becomes possible again as well. Theoretical trying and testing spares the detour via action per selection. 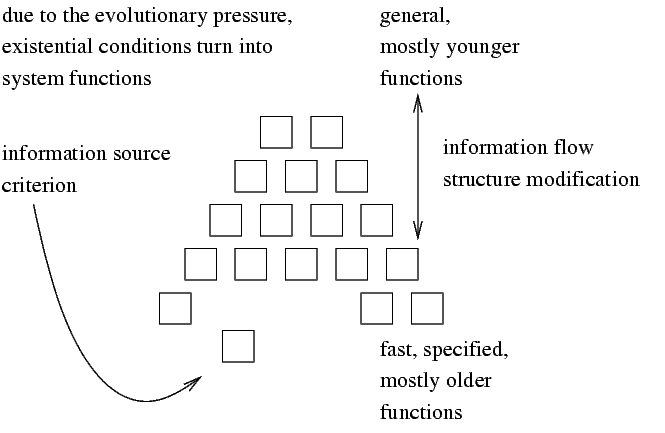 Functions at the lower level are mostly older, faster, and more specified functions. They are being accessed by higher levels like a command variable. This means that the function is, for the most part, autonomous and stable, and being controlled from the upper level. It can be addressed from several places which saves memory storage- and optimization efforts. In this way, the system structure emerges and develops further. The signals between levels are the control commands for the lower levels. The higher the level considered is, the more general and abstract are these commands, is the language between the levels and building blocks.